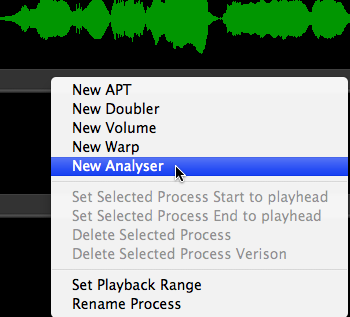 Press B to open the New Process window (unless it is already open) and select Analyser in the Selected Process drop down at the top, or RIGHT CLICK on a track's Process Control bar below the track, and select New Analyser. 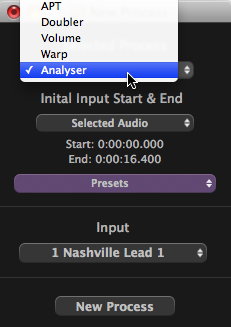 Make sure the input audio channel is the one you want to analyse, then press the New Process button at the bottom of the New Process window, or N on the keyboard. 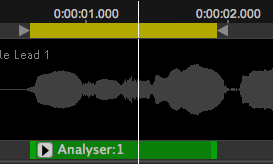 Nothing will appear at first, except a green bar in the process control track, showing the presence of an Analyser process. Click on button to open the Process Control Panel (or press P on keyboard). 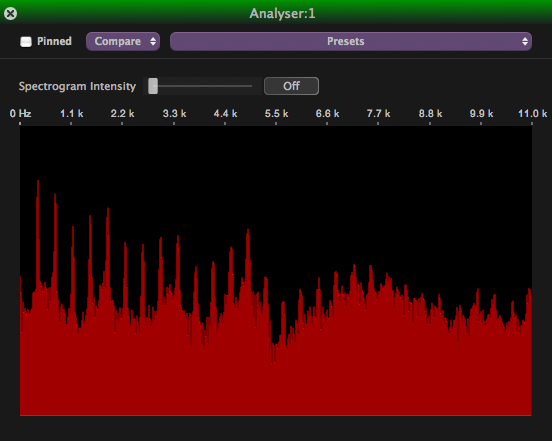 The Analyser control panel will appear showing a red graph of the sound level (vertical axis) at different frequencies (horizontal axis).